Wey (Chinese: 衞; pinyin: Wèi; Old Chinese: *ɢʷat-s, commonly spelled "Wey" to distinguish from the later Wei 魏 state) was an ancient Chinese state that was founded in the early Western Zhou dynasty and rose to prominence during the Spring and Autumn period. Its rulers were of the surname Ji (姬), the same as that of the rulers of Zhou. Its original location was on the North China Plain just east of the Shanxi plateau and north and west of the Yellow River. Jin was to the west and Cao to the east. The history of Wey dates back to the beginning of the Zhou Dynasty, when the younger brother of King Wu of Zhou was given a fief centred on Zhaoge, the capital of the Shang Dynasty; in later years the fief was further expanded. In 346 BC, the duke of Wey degraded himself to a marquis. In 320 BC, the marquis of Wey again degraded himself to only a jun (lord). And by then Wey only possessed a county called Puyang (濮阳). In 254 BC, King Anxi of Wei (魏) killed Lord Huai of Wey (卫怀君), but two years later he declared his son-in-law, who was from the house of Wey, to be lord of Wey, so Wey became a dependency of the Wei Kingdom. 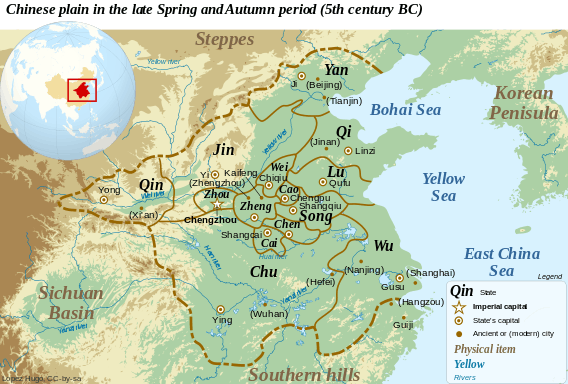 In 239 BC, Qin occupied Puyang, and Wey migrated to Yewang (野王) in order to preserve its existence. The state was so weak that it was presumably ignored by Qin Shihuang and was only abolished in 209 BC when Qin Er Shi deposed Jiao, Lord of Wey (卫君角), 2 years before the collapse of the Qin Dynasty. 1 2 3 4 5 6 7 8 9 10 Gōngzǐ (Chinese: 公子; literally: "The Lord's Son") is a title attached to the sons of a ruler. ↑ Yòugōngzǐ (Chinese: 右公子; literally: "The Lord's Son of the Right") indicates the title holder being a son of a ruler. ↑ Zuǒgōngzǐ (Chinese: 左公子; literally: "The Lord's Son of the Left") indicates the title holder being a son of a ruler. 1 2 Tàizǐ (Chinese: 太子; literally: "The (Lord's) Heir Apparent") indicates the title holder being the eldest son of a ruler. 1 2 Gōngsūn (Chinese: 公孙; literally: "The Lord's Grandson") is a title attached to the paternal grandsons of a ruler. In two instances above, Gongsun Banshi was a grandson of Duke Xiang, while Gongsun Mimou was a grandson of Duke Ling. If a person was also a son of a ruler, the title Gōngzǐ (公子) was used instead.